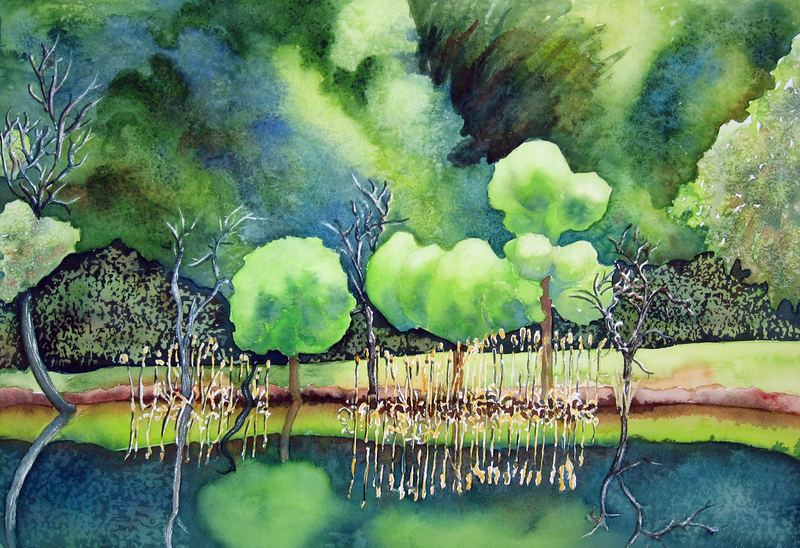 Today I selected a spot right next to the shoreline of the pond and decided to try to render and paint the cat tails and aome interesting trees that looked like lime-green cotton candy. I drew a simple line drawing and masked out the cat tails and the dead wood that I saw. 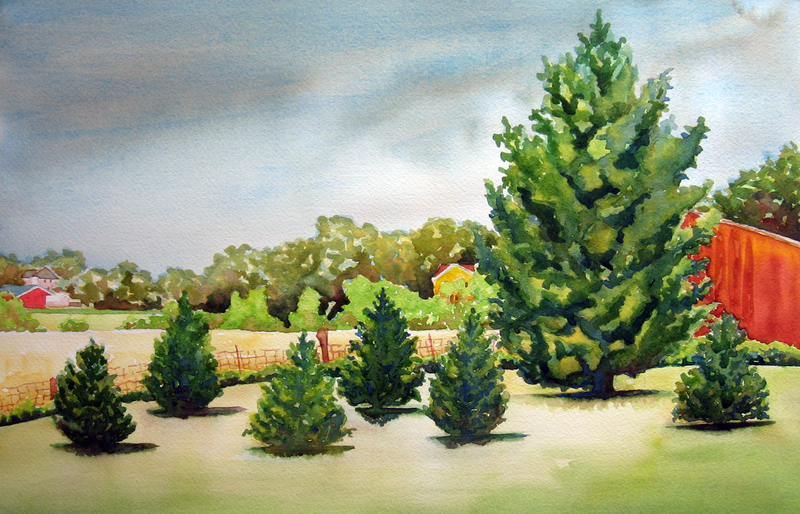 I next rendered the dainty trees I wanted to feature as well as the tufts of foreground trees to either side of these. 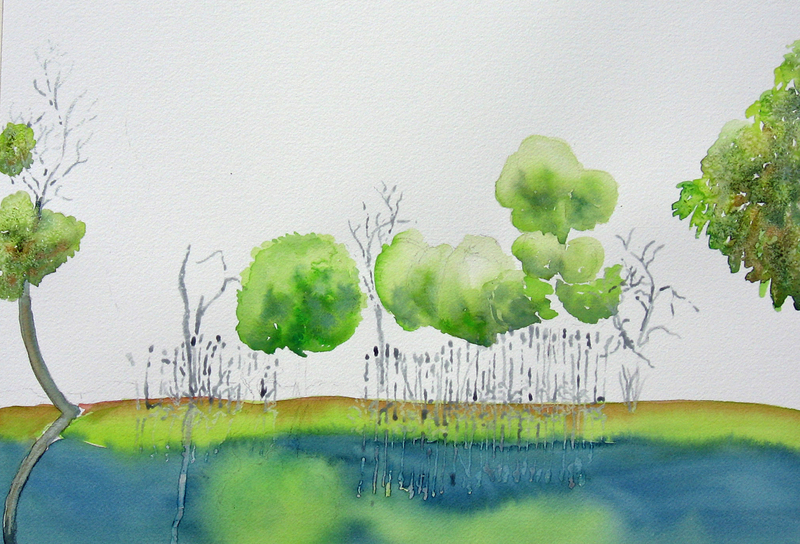 I then ran a wash of the foreground pond reflections, painted the background trees wet-in-wet, dropping in salt as I went. Before I darkened the underside of the trees I masked some abstract marks in over the green washes where I painted in the deep darks. 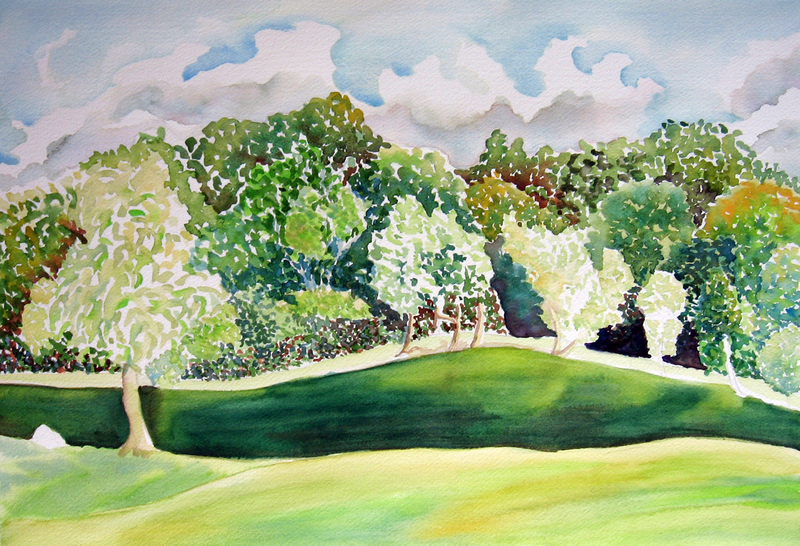 I painted in the light wash between the woods and foreground and placed the shadow I saw to the left. These were quick light washes. 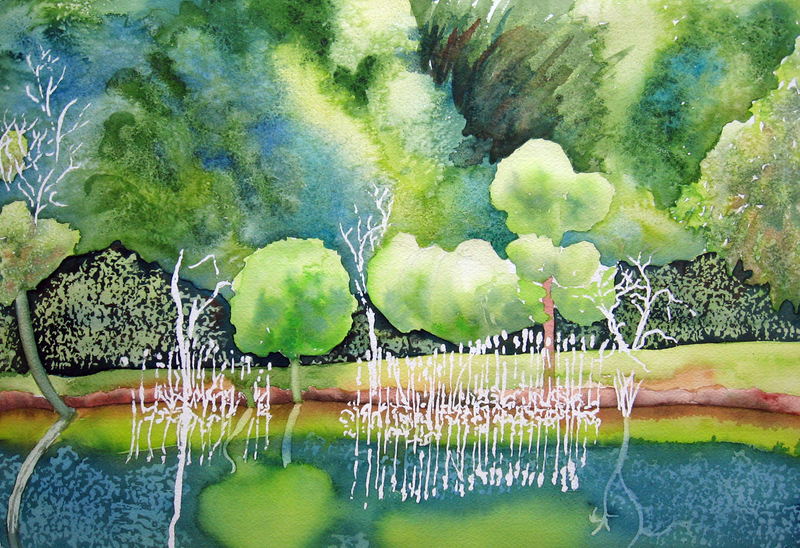 I then concentrated on the bank and defined the reflections in the water. I had to mask the foliage reflections in the water. 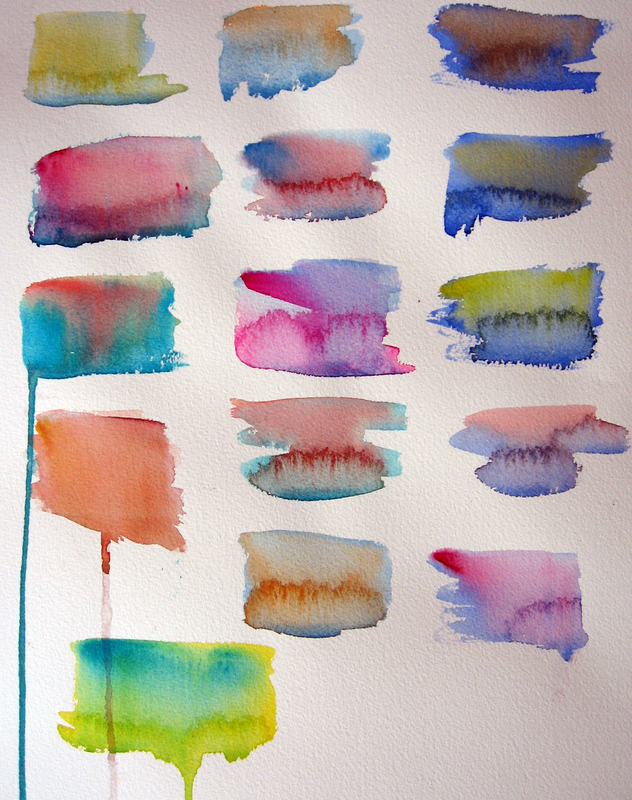 I realised I had used analagous colors of yellow, blue and green, predominantly. I chose a red (burnt sienna) to help define the far bank and enhance the darks. 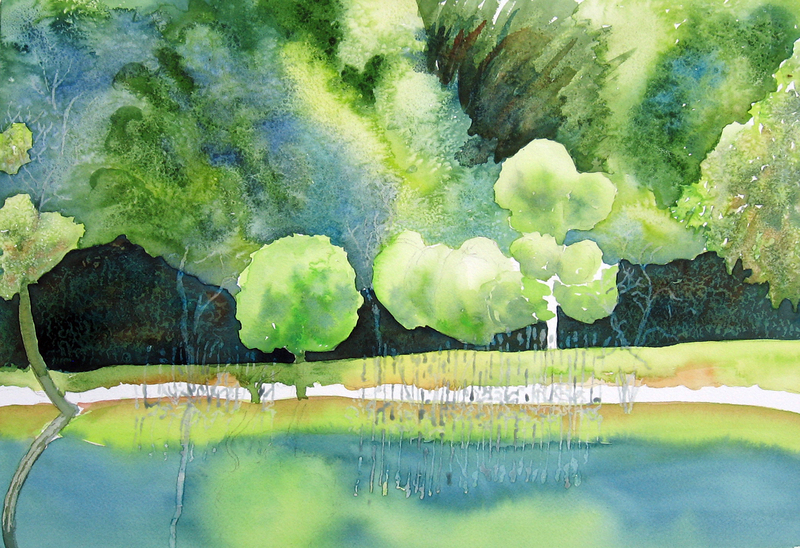 I chose this color because it went with what I was seeing on the bank and was a compliment to the greens. I then washed back over the reflections in the water. I then removed the masking and salt. All of the above work was done plein air or on-site. This took me about four hours. To finish the painting, I handpainted, with a fine brush, the details of the cat tails, deadwood and tree trunks. I scratched out limbs on the dead wood with a pointed scratch tool. I darkened some of the trees in the background as well as fed some darks in and around the base of the cat tails and along the bank. 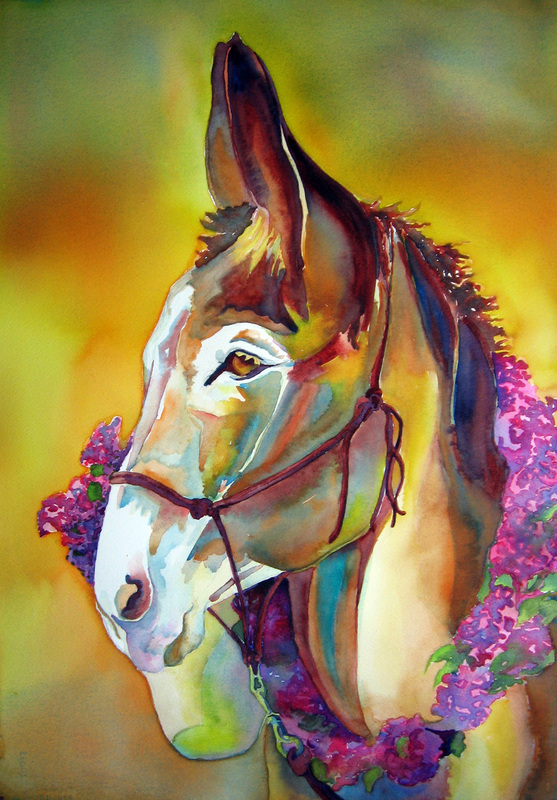 I washed in some light washes of greens and burnt sienna and yellow over the foliage in the background darks. To just add to the last post a little, about “Little Trees”? The little tree on the far left has not made it thru the heat spell. I am so glad I took time to paint the scene before this happened. It never ceases to amaze me how many things I have painted that are no longer in existence. I drew an image of an old ramshackle house and barn one day, in the country. The owner allowed my friend and I to sit on her driveway and we were thankful for the opportunity. It is no longer there. I treasure some of these images and will always wonder if my desire to record those six little trees in a row, first, was a whim. I really don’t think so. 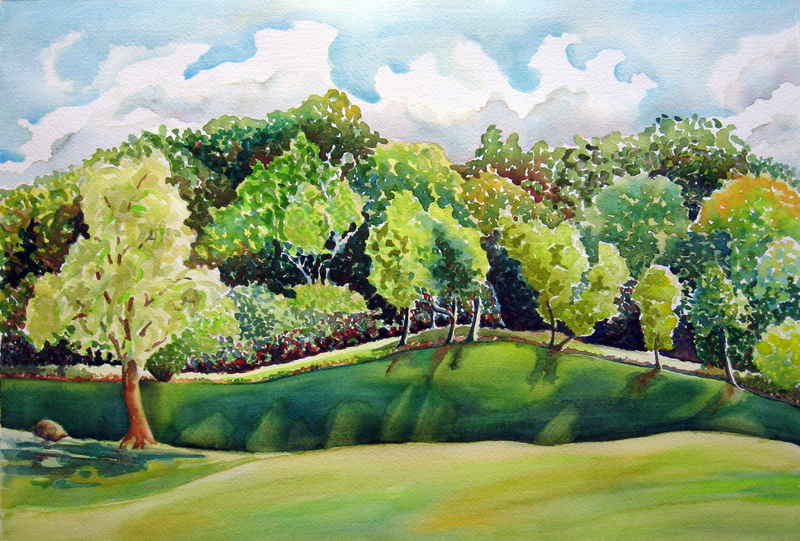 I revisited my friends’ property to attempt a plein air painting since we finally have a couple mid 80 degree days, here. 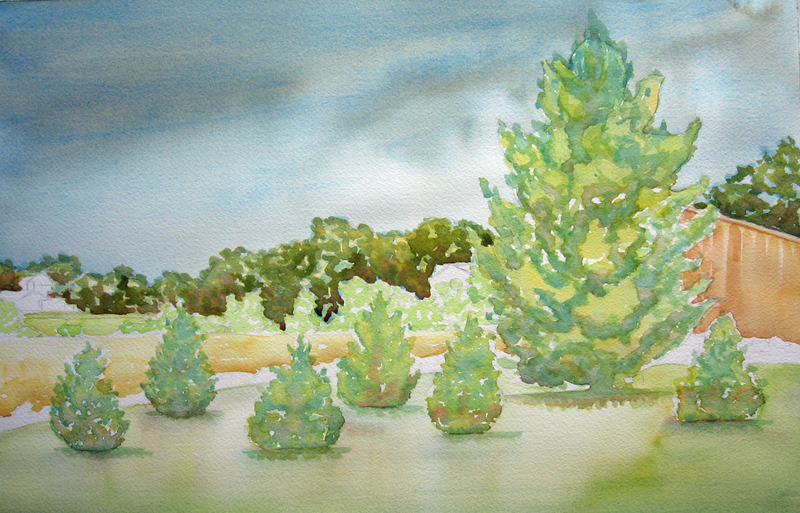 I sat under some huge pines to view and paint this scene. The painting, above, was what I ended up with in four hours of seeing and recording. I’m SLOW, Stephen, 🙂 . The dark strip in the lower middle is their pond. I can see I’m going to have to come up with some kind of painter’s lie in rendering this pond. It is gorgeous, however, and I’d like to capture the essence of it eventually. It is dark and mysterious and reflects glints of things surrounding it. It looks like glass, most of the time, and like you could fall forever into it. There was a light breeze and I could hear a hawk and the whispers of the pines I was sitting under. I jotted down notes as to how I wanted to finish the painting . The light streak on the other side of the pond is a walkway around it. The owners took me for a ride in their golf cart around the pond so I could see from all sides of the property. What a wonderful view of Indiana. Oh. I have taken photographs. It never ceases to amaze me that what I see, while painting outdoors, is so DIFFERENT than what I see in the photograph. Those of you who paint plein air know this to be true. The curve of a shore line, the color of the trees, the shape of a reflection. I am not saying one is better than the other. In fact, I think it only strengthens the view that a photographer has to be a phenomenal artist, also. I visit Kate, “Y” , Kirsty, and Laurie on a regular basis. I like to see what they see. Oh! …and Carol just introduced me to Jimmyboi2 whose recent trip up the east coast is full of photos of architecture. I just ran across a beautiful poem about a pond at Adam’s poetry blog here. I suppose it is time to post some scenes of my home state. Friends of mine have been nice enough to offer their property for me to come out and do some outdoor painting as well as take photos to paint from. This will be an ongoing project for me. This first painting I did from a photo I took the first time I visited. There was a storm moving in and I wanted to set the tone so I painted the sky, first, using a gray I mixed from manganese blue and halloween orange. 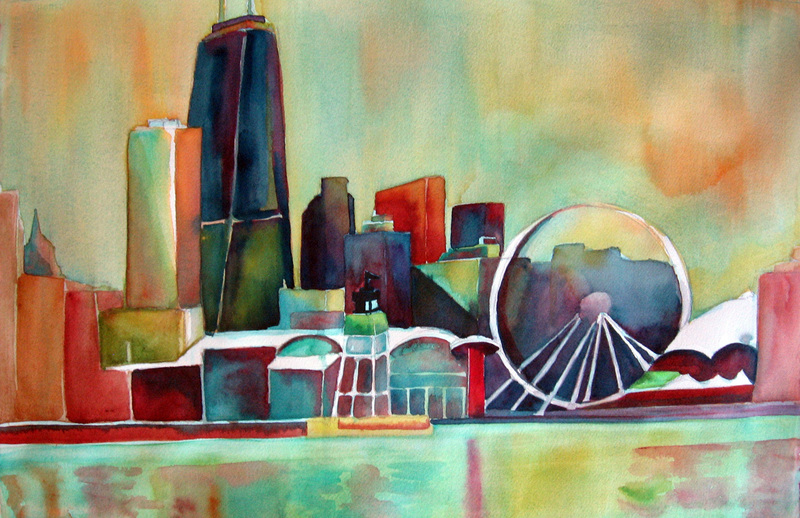 I also dropped in a reddish mixture I made from fire engine red and burnt sienna in the upper left quadrant because I knew I might have to balance the red of that out building on the right. I then got busy and applied my first washes to everything so I could see where I wanted the light to fall like I had learned in my recent workshop. This took some time. I also wanted to include yellows to give the effect of the yellow light we get, here, right before a storm moves in. I think that light, combined with the interesting little tree shapes lined up by the big pine, was what inspired me to create this painting. 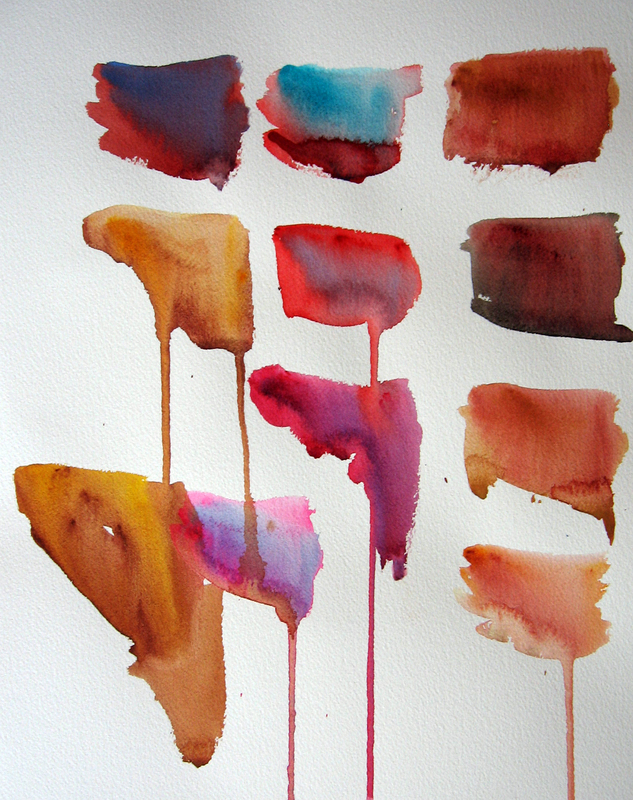 I posted this stage of my watercolor to share with you how light those first washes are that I apply. 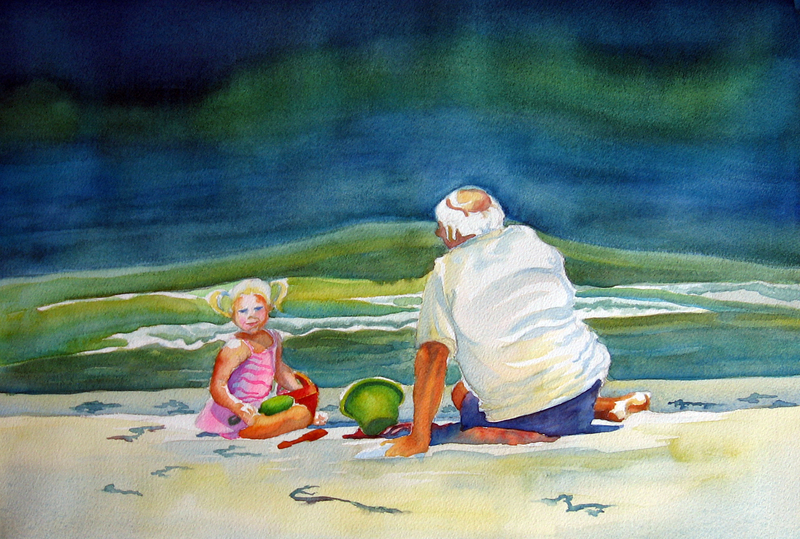 All the colors I used for this initial wash would be considered light or light middle colors. I knew my trees in the foreground were going to be my darks and what I wanted the viewer to see the most, so I chose to interweave my lights in and around the base of them. They had funny little puddled shadows underneath and I liked that and enhanced these things as I worked. The above is the finished painting after going in and turning on the color with midtones and defining the trees and the far treeline with darks. This is pretty much what it looked like that day as those dark clouds began to move in. It was pretty hot and muggy so I tried to keep my definition of the far treelines and homes to a minimum so as to reflect that haziness that humidity causes. 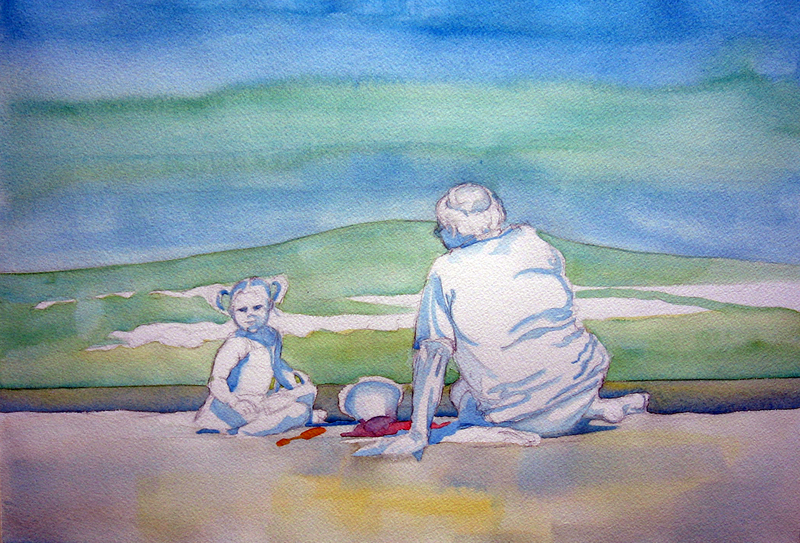 The sky you see in the final painting is the only thing that I did not add to from the initial washes. I painted the wires of the fence with a hairline brush and blotted it with a tissue, while still wet, to soften the harshness of the line. Recently, Alex posted her self portrait and discussed how it did not look like her. I commented and we discussed my adding a self portrait page. I have taken time to do this today. You will find them here. 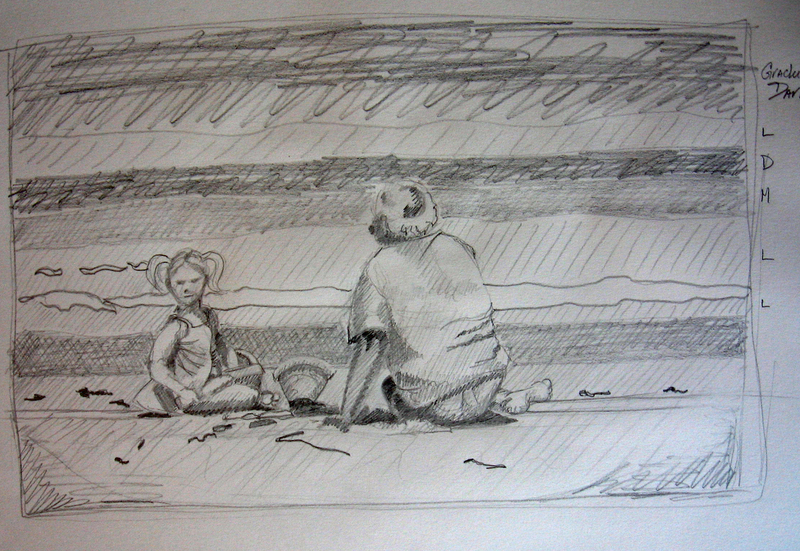 I will add to this page everytime I use my image to practice my drawing or painting. 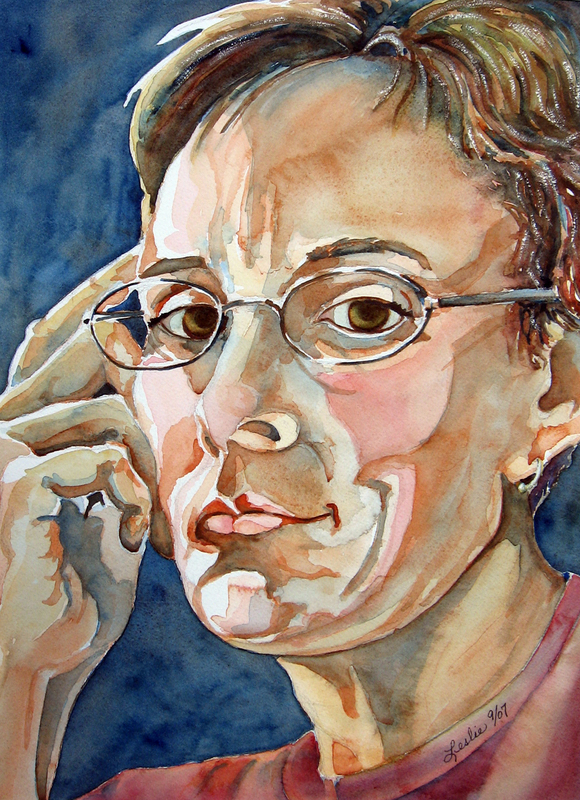 I am always concerned with a likeness, but you will be able to see that there are many versions of myself on this page. Never do I look the same. Over time, I have not been as concerned with that. These exercises or studies, done from myself, have increasingly caused a chuckle and a better understanding of this wonderful activity of drawing and painting we engage in. I do not know why I did not post these sooner. My family says they do not look like me, but my granddaughter says “Grandma” each time she sees one. Go figure! The above portrait is my favorite of the collection, so far. Sandrine and Richard have both posted self portraits recently, also. Blogger friends of mine have taken the time to try to write selfportraits of themselves per my request. They did a wonderful job!!! You can find them here and here. I had never thought about how one could take words and a mirror image and compose a self portrait in words. I wondered if it was as difficult and if the mind wandered while writing a description of self. That critic in all of us seems to come to the surface when we concentrate on ourselves as the subject material. Thank-you Bouzouki and Ichabod for describing yourselves. I SEE YOU! This was my small sketch or value study for this painting. The line drawing and first washes. Darkened foreground and background. Softened edges around figures. Darkened shadows on Grandpa’s hair and shirt. 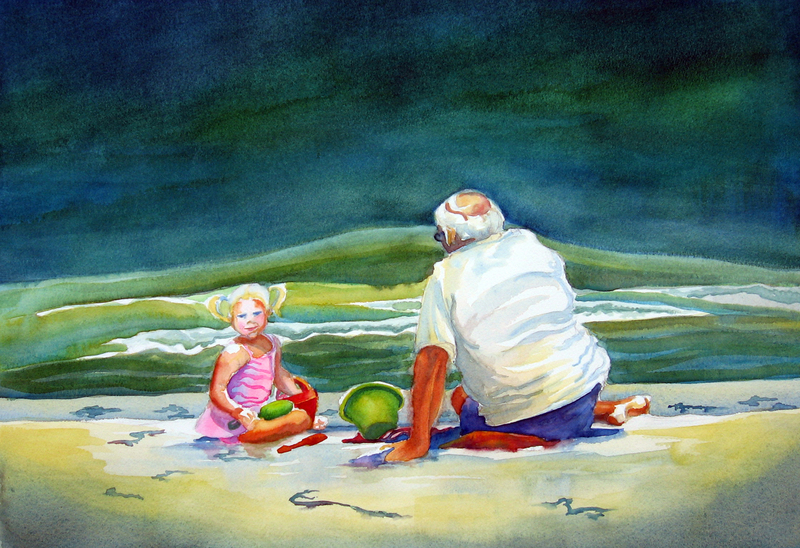 My Granddaughter loves going to the ocean with her Grandfather and I wanted to try and capture a moment of their time together in paint. Little People and a Home Run! 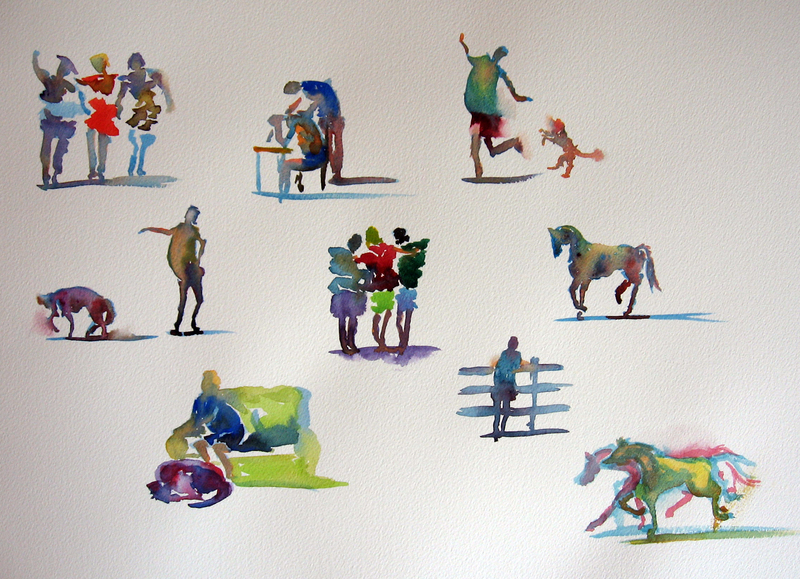 The third and final day of the workshop included a demonstration on how to paint little people. 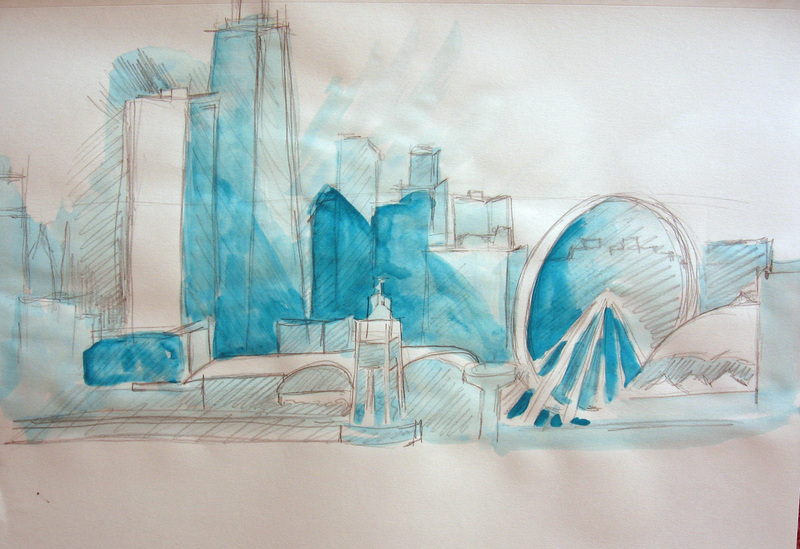 Don stated that he visits shows and sees beautiful landscapes and cityscapes and many of them have no people in them. He talked about how little people don’t have to have a lot to them but they do need proper proportion and believability. He demonstrated proportions and even showed us how to make people from blobs of color! He referred to the process as little gestures and I was fascinated by the whole process. Above is my sheet of little people I practiced. I used every color I could think of. The other thing he taught is how to soften an edge. I NEEDED TO LEARN THAT!!!! I had read how to do it, before, but was always leaving too much water in my brush. I began to practice rinsing my brush and wiping it on a scott towel (squeezing the water out of it) and then sliding it across my paper toward the wet edge I want to soften (this must be done while the edge is still wet). I am starting to get it, I think. Now, with practice, I may be able to create some less edgy paintings. PHEW! Don then spoke of flesh tones and how to mix them, but I saw so many colors allowed to bleed into each other and was impressed with all colors used to create people. He had some small paintings of futhur developed figures on display and I was really impressed with these. 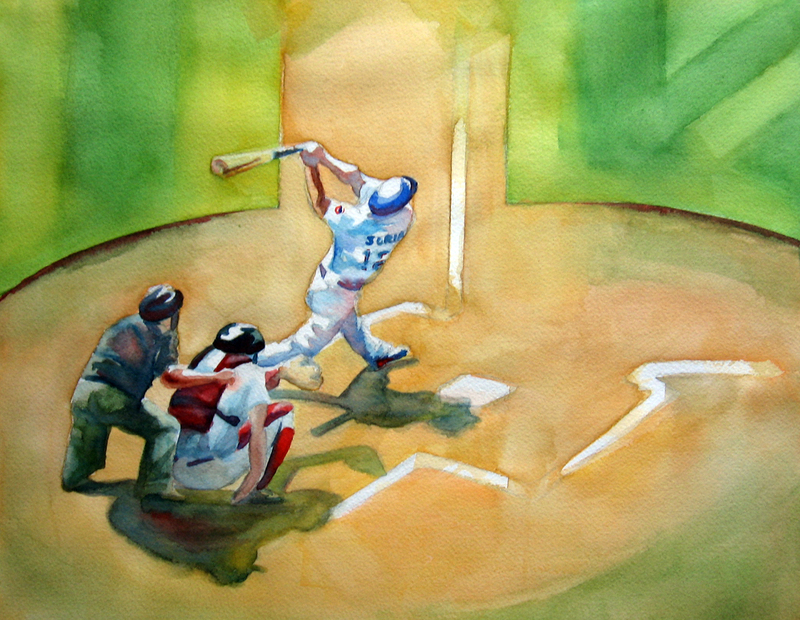 When I came home, I looked up a sport photo on wet canvas for a grouping of figures doing something and came up with a painting of my own, below, where I concentrated on color blobs and light and soft edges on figures. Check out these figures that Keith just posted on his blog here and here. I love them, Keith!!!!! 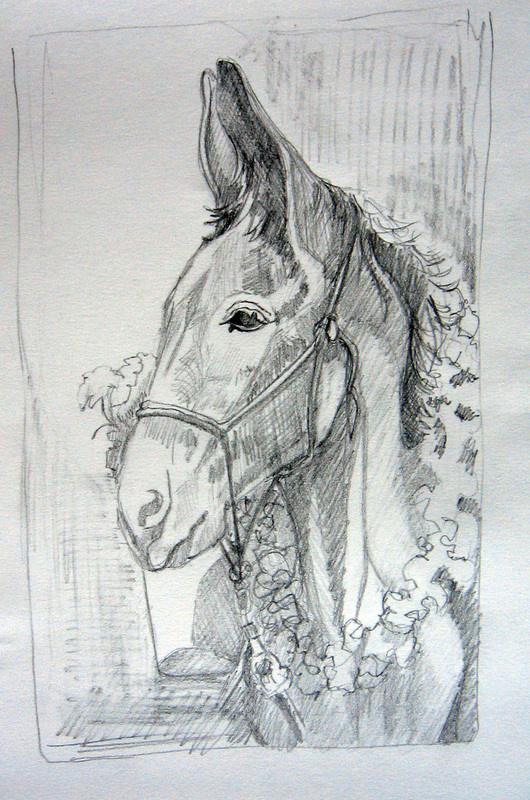 The evening of the first day of the workshop, I sat down and did my pre-sketch of a donkey for the next day. I also drew a line drawing of her on watercolor paper so that I would have something to start working on the second day of the workshop. Don spent the morning talking about granular washes and demonstrated how he paints them. He said these can be done with any name brand of watercolors. He spoke of specific colors and divided them up into three groups of light, medium and dark colors. I learned how important it was to know which colors are light , medium and dark. I had always found a color I liked and added more water if I wanted it to be lighter. In essence, what I was doing is really saturating that color and not allowing it to be what it was designed for which was to be a dark. Sounds like a “no-brainer” but I had never connected with this before. I am going to have to spend some time with my colors, now, and decide which ones fit into which values because I like this way of thinking and painting. He showed us different color combinations and how to turn our paintings on with the midtones. He also talked about different kinds of contrasts to include in our paintings. The whole time we should be thinking of contrasts of neutrals and colors, lights and darks, lost edges and hard edges and finding places for all of it. I hope I can remember all of this as I continue painting. It is my new goal. This week I had the opportunity to attend a Don Andrews Workshop offered by our Allen County Public Library. What a wonderful experience. I learned so much! The above painting was created after he instructed about how to create a pathway of light by first doing a value sketch to use from reference material you choose. He spoke about how to lay in granular washes and what an artist can do to furthur enhance a center of interest and where it should be placed. I actually took the time to do a value sketch and found it less time consuming than previous times I have done this. I learned to simplify and bring out some of the important things I wanted to focus on. I painted in the darks on my sketch paper to save time (rather than shading with graphite) and I actually ended up using my value sketch more than the reference photo for this image. I found this to be totally freeing and, as I painted, I began to sense that the painting was telling me more and more of what I needed to do than the actual reference material. A day spent on composition was very helpful.